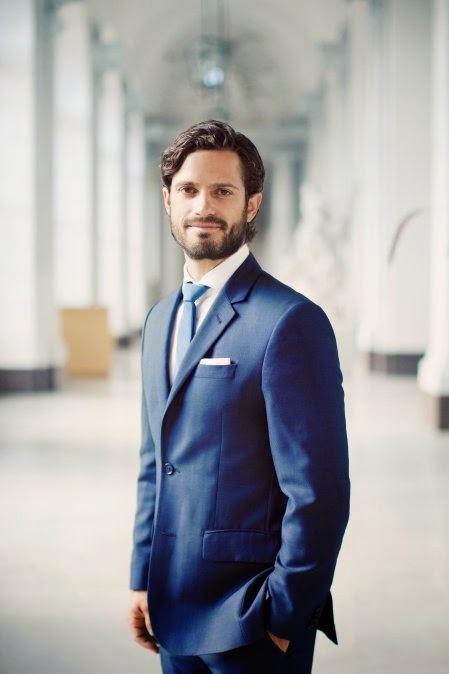 Last week, the Swedish royal court released new details about the upcoming wedding of Prince Carl Philip, the only son of King Carl XVI Gustaf and Queen Silvia, and Sofia Hellqvist, including the wedding date and venue. Carl Philip, who will turn 36 in May, will wed the former model on 13 June 2015. (The day will be a busy one for royal watchers; Trooping the Colour, the official celebration of Queen Elizabeth II's birthday, will be held in London on the same Saturday.) The wedding will be held almost a year after the couple's engagement, which was made official on June 27. The Bernadottes nearly always marry in June. The King and Queen were married on 19 June 1976, and Crown Princess Victoria and Prince Daniel wed on the same day in 2010. Princess Madeleine's wedding anniversary is June 8. Three of the king's sisters, Princess Margaretha, Princess Désirée, and Princess Christina, were also married in June. The wedding will be held in the Royal Chapel at the Royal Palace in Stockholm. It's the same place where Princess Madeleine married Christopher O'Neill in 2013. And because the same person who coordinated Madeleine's wedding, Major Gen. Håkan Pettersson, is also in charge of Carl Philip's big day, I think we can expect to see many similarities between the two events -- including similar white-tie dress codes, with major jewels! Which royals can we expect to attend? The guest list won't be released until much closer to the wedding day, but as with both Victoria's and Madeleine's weddings, we should see the entire Swedish royal family, including the king's sisters. Prince Carl Philip has three living royal godparents -- his aunt, Princess Birgitta, Prince Leopold of Bavaria, and Queen Margrethe II of Denmark -- and all of them will surely be present. The royal guest list will probably resemble that of Madeleine's wedding overall. As far as the Windsors go, I imagine we'll see the Wessexes in attendance, with the rest of the senior royals remaining in London for the Queen's birthday parade. Carl Philip recently gave an interview to on Swedish television where he discussed his struggles with dyslexia and the couple's relationship. Sofia's past occupation -- that of glamor model and reality TV star -- has caused a bit of an uproar in the Swedish press during the couple's relationship. Carl Philip angrily noted that Sofia "was hung out to dry in a bullying type of way" by the press, and he countered claims that the royal family disapproved of her initially, explaining that his family "were curious about her, open, and welcomed her with a big hug." The couple met in 2009 and have been living together for three years. After the wedding, Sofia, who turns 30 in December, will be styled HRH Princess Sofia of Sweden, Duchess of Värmland. The couple released a statement through the royal court about their wedding plans: "We are looking forward to a summer wedding in the middle of June, when Sweden is extremely beautiful. This will be a big day for us, and we are absolutely delighted." This will be the last royal wedding in Sweden -- and indeed in Scandinavia -- for a generation. Which royal jewels would you like to see worn at this glittering event?